Goldfinches live throughout the United States and southern Canada, a fact that makes attracting them to your backyard a bit easier. In July and August, after the male has serenaded the female with canary-like songs, goldfinches begin their nesting season. The location of the nest is usually five to 10 feet high in trees or shrubs and often near a water source. But you can’t talk about goldfinches without mentioning their favorite food, Nyjer® (thistle). In fact, it’s one reason goldfinches delay breeding until the greatest number of thistle, dandelion and other composite flowers are seeding. This delay gives you the opportunity to focus your attention on goldfinches during this exciting time of song and activity (especially since other birds can be less active and busy with their new families). 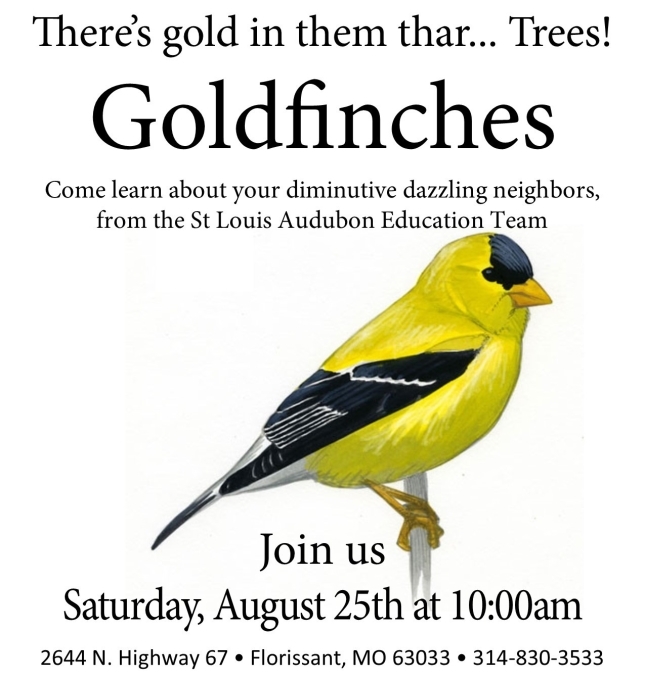 So join us at the store on Saturday, August 25th at 10:00 am and learn about get everything you need to keep goldfinches visiting your yard.